The Karoo basin was once the site of an inland sea at a time in the earth’s history when all landmasses were joined in a single supercontinent known as Pangea. The Permian period (200 – 300 million years ago) ended with the most extensive extinction event recorded in paleontology – 90% of marine species and 70% of land organisms became extinct. These organisms would have sunk to the bottom of the sea, been covered in silt and mud, and then decayed anaerobically, eventually forming the fossil fuels we extract today. It is important to understand that the Karoo basin is far more extensive than the area we refer to now as the Karoo and includes all of Lesotho, almost the whole of Free State, and large parts of the Eastern Cape, Northern Cape, Mpumalanga and KwaZulu-Natal. The Karoo basin’s sea was deepest (and therefore has the thickest deposits of fossils) between Graaff Reinet and Somerset East, thinning out completely in KwaZulu Natal at the Mvoti River. Over time these deposits formed what is now referred to as the Ecca geological group, comprising shale and sandstone formations. 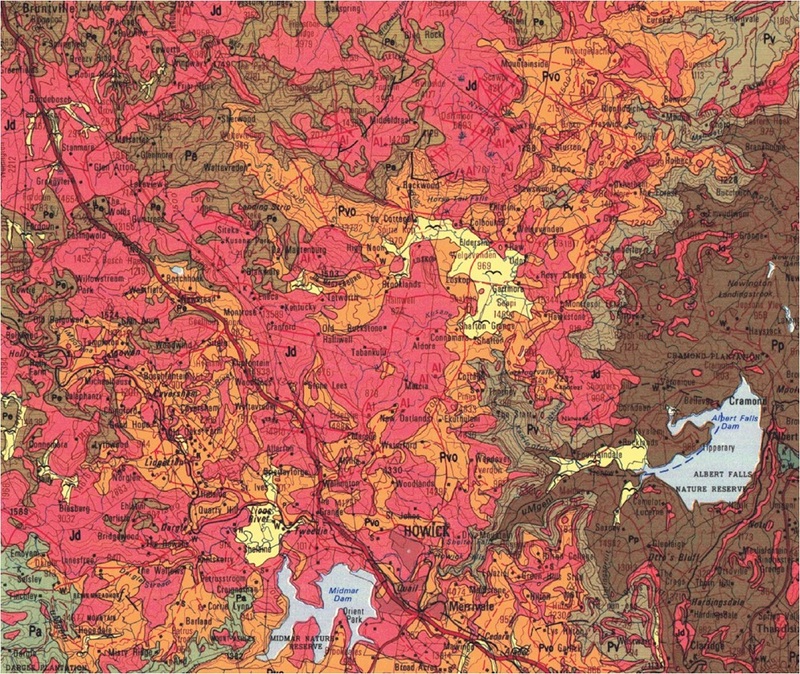 There are three main types of Ecca shale – Vryheid, Volksrust and Pietermaritzburg shale – in the KZN Midlands. In the KZN Midlands there is also a lot of dolerite. Dolerite flowed from volcanoes forcing its way through cracks in other types of rock. It appears as sills (horizontal), and dykes (vertical) intrusions. 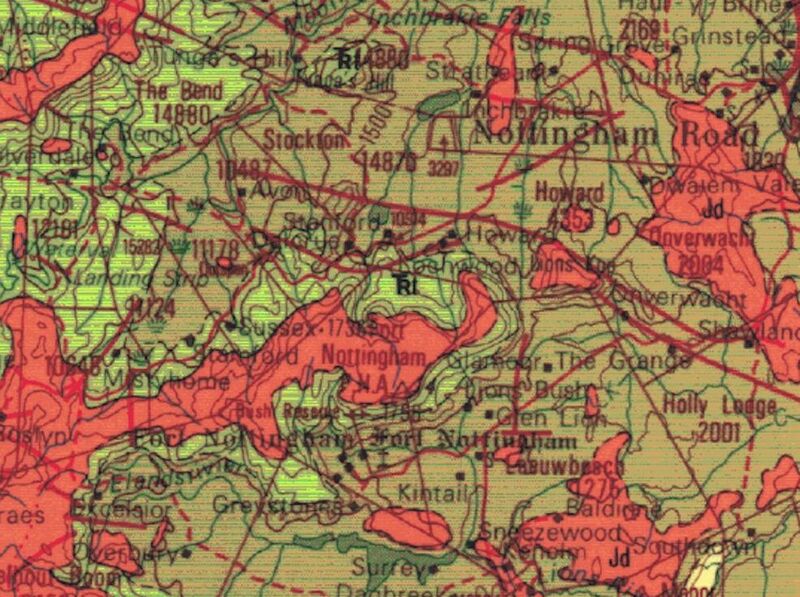 Dykes are present in such numbers in the Berg and around Nottingham Road that they are referred to as Dyke Swarms (shown on geological maps as bright pink or red lines). Dolerite is a known preferential pathway for liquids. In the KZN Midlands and Berg foothills, technical cooperation permits have been issued to companies interested in extracting the natural gas that may be trapped in the shale, using a technique known as hydraulic fracturing, or more commonly, fracking. Sand, water and chemicals are pumped into a well under pressure, which creates cracks in the rock, releasing the gas. The presence of Dolerite, however, makes drilling more difficult and less profitable, as well as increasing the risk of groundwater pollution and the movement of water from the fracking area. In order to verify the amount of shale gas present in the Midlands and its viability as an energy source, further exploration will need to take place in the form of test wells. Test wells are drilled through rock layers containing sub-surface and deep aquifers of groundwater as the companies search for the shale rock that may hold shale gas. Although the wells are encased in sophisticated layers of concrete, there is concern about the concrete failing and the fracking chemicals escaping into groundwater. 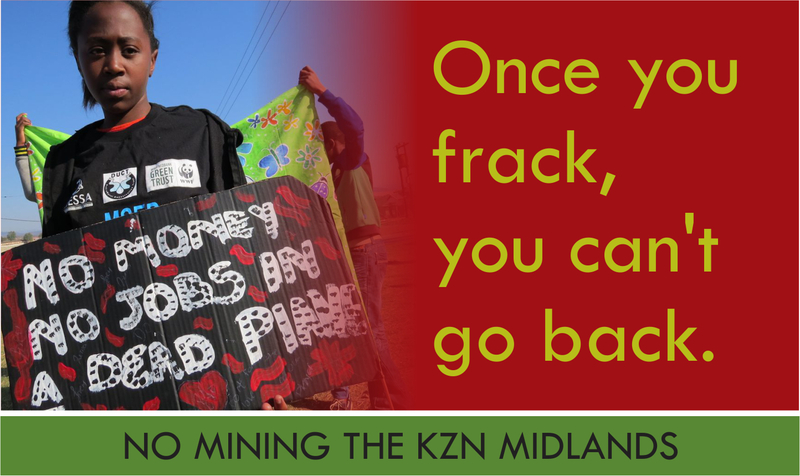 In the Karoo situation, accounts of the South African state owned company Soekor’s drilling efforts in the 1960’s, indicate that drilling fluid travelled for many kilometres from one well – probably along a dolerite fault. 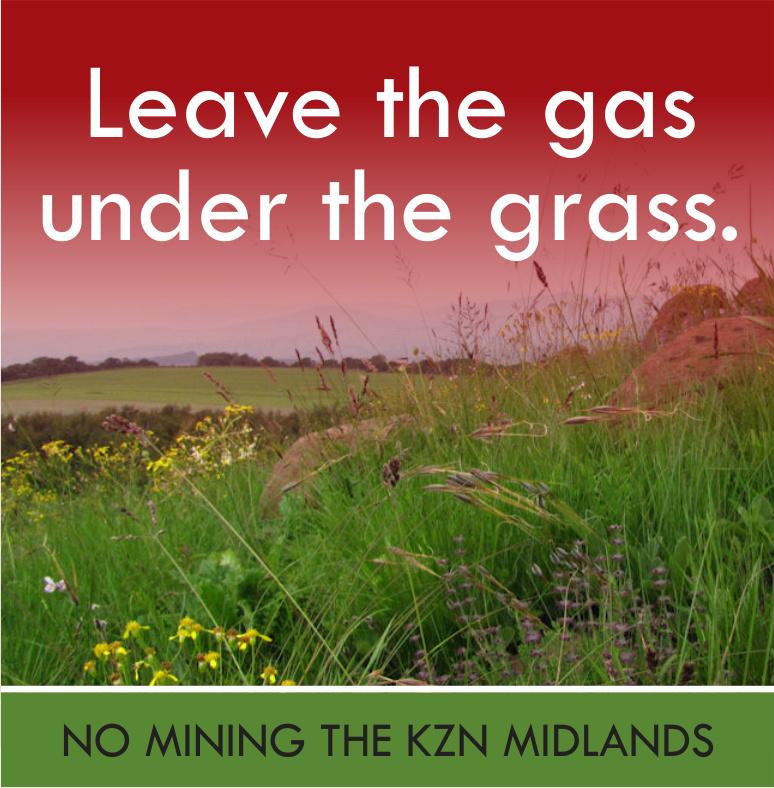 This surely means that in order to protect our ground- and surface- water that the KZN Midlands shale should not be mined or prospected? Remember that groundwater is recharged from the surface water and eventually flows to the surface naturally, ‘daylighting’ into springs and seeps. If our groundwater is contaminated, then not only will it affect those using groundwater from boreholes, but also the rest of us who use water from the streams, rivers and dams into which it ultimately flows. The Midlands Conservancies Forum believes the precautionary principle should be invoked, as the risk is too high. The shale in KZN is located in a relatively narrow layer, which means that yields will be low and thus not profitable. The presence of these Dolerite dykes should also deter prospectors, but we need to remain alert. 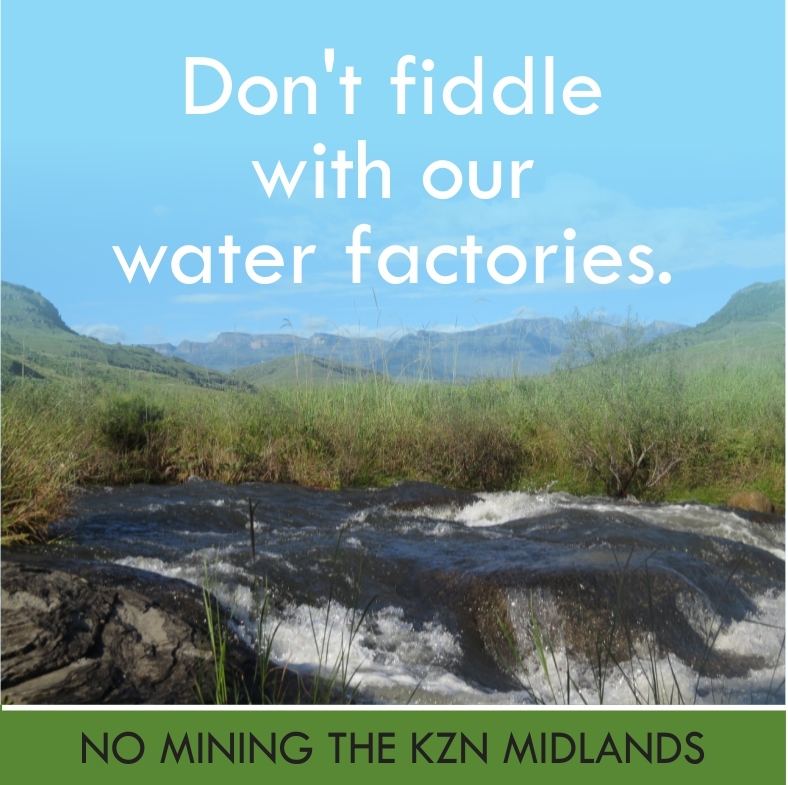 This entry was posted in Environmental Issue and tagged environment, fracking, KZN Midlands, water factory, water pollution on April 28, 2015 by Midlands Conservancies Forum.